Published: Aug. 17, 2015 at 02:13 p.m.
We had a full slate of preseason games over the weekend, which gave us our first real look at a number of players who could make a fantasy impact this season. Some of those players made a positive impact in the first full week of preseason. Others did not. We take a look at 10 players whose draft values were impacted by the week that was. I had high hopes for White this season, believing he could be this year's version of Mike Evans. However, it appears that all of that is on hold after news broke over the weekend that White will have surgery on his injured shin and is expected to begin the season on the PUP list. 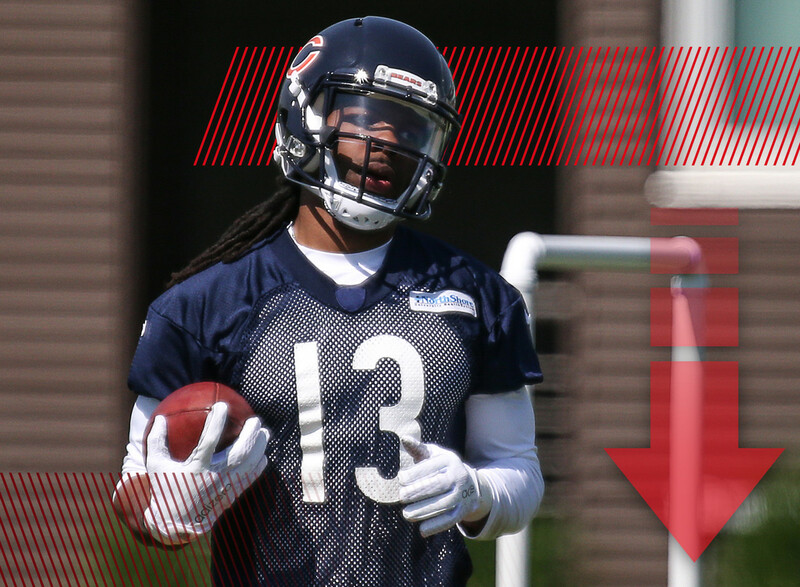 Expect Marquess Wilson to move up in the pecking order, but White's injury is likely to shine a bigger spotlight on Alshon Jeffery and Martellus Bennett. Few players all weekend made the same type of eye-popping plays that Abdullah did. The rookie from Nebraska was the star of Vine after his preseason debut on Thursday. The Abdullah hype train was already getting crowded. After what he did this past week, it's going to be positively overloaded. It's only a matter of time before he takes over for Joique Bell at the top of the Lions running back depth chart. The Eagles offense as a whole looked pretty solid, but the rookie from USC had a particularly nice debut. Agholor caught three passes for 57 yards with a touchdown and looks ready to be a nice complement to Jordan Matthews. When Chip Kelly's offense is working as intended, there is plenty of fantasy production to be had -- especially at the wide receiver position. Agholor's current ADP makes him a bargain, but the word could be getting out ... quickly. As the Patriots wait for a resolution to The Tom Brady Situation (which would be an excellent name for a hipster band), they took a look at the next man up. The results ... weren't great. Jimmy Garoppolo's final numbers (20-of-30, 159 yards) belied a quarterback that struggled to generate much offense while he was in the game. Admittedly, he didn't have a lot of his top weapons, but he still didn't do much to inspire confidence. Then again, it's also just one game. Speaking of just one game, the Bucs are probably taking the same approach after Jameis Winston's shaky debut. The No. 1 overall pick struggled to a 9-of-19 finish with 131 yards and an interception while battling accuracy issues. Winston's struggles were more glaring when you consider that Vikings' second-year quarterback Teddy Bridgewater looked so good. Winston wasn't drawing a ton of fantasy draft hype, but his poor start is likely to clamp down what little momentum there was. Shorts only caught one pass in Houston's preseason win over the 49ers, but it happened to be a 58-yard touchdown from Brian Hoyer. That score put an exclamation point on the recent reports that Shorts has looked very good in training camp for the Texans this season. Combining that with a less-than-stellar beginning from rookie Jaelen Strong means that the veteran could be in line to start the season as the No. 2 wideout alongside DeAndre Hopkins. The big story surrounding Kaepernick this offseason involved the 49ers quarterback working with Kurt Warner to improve his accuracy. What we saw of Kaepernick on Saturday wasn't completely encouraging. As I wrote back in July, it's fully possible that we have already seen the best of Kaepernick. If the Niners quarterback can't return to his past form, it's going to have a sobering effect on the production of Vernon Davis, Torrey Smith and Anquan Boldin. While it might not have been a great day for Jameis Winston, it was a nice start for Doug Martin. The former Boise State star is looking to rebound after a pair of injury-plagued seasons. Martin had been earning praise in camp and on Saturday, we saw why. It looks like the burst we saw from Martin as a rookie has returned. There is still concern about an offensive line that was horrid last season (and on Saturday), but Martin's late-round ADP could turn out to make him a nice draft day bargain. Plenty of fantasy enthusiasts were dubious about Thomas' move from the high-powered Broncos offense to the fledgling Jaguars attack. Those concerns are likely to be magnified with Thomas suffering a hand fracture that will keep him out for the remainder of the preseason. Thomas should be ready for the start of the regular season and will be a nice red-zone target for Blake Bortles. But this injury will do nothing to allay the fears of those who have already downgraded Thomas. Cooper and Kevin White were the first two wide receivers selected in the NFL Draft but with White out of action for a while, all eyes were on the Raiders youngster. It was apparent early in Friday's game with the Alabama product seeing a number of targets from second-year quarterback Derek Carr. Cooper has earned rave reviews for his early work in camp and this weekend's performance seems to validate any and all reports of Cooper being the go-to guy in Oakland's pass attack.